Hope everyone had a nice and safe 4th of July weekend. Ours started Thursday night in Anthem with my in laws, where literally the whole community celebrates. 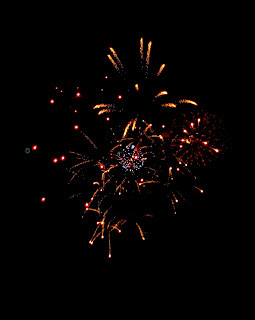 The fireworks were great! You can tell the heat is getting to you when you start dancing to Fergie’s “Clumbsy” in front of everyone! 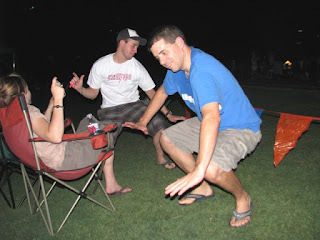 I had to snap a picture of my hubby and brother in law breaking it down! Nice moves guys! No more hacking into my blog Mr. Picky Palate! Friday night we had a pool party/neighborhood firework party at my sister’s house. Thank goodness a storm blew in and cooled everything off. 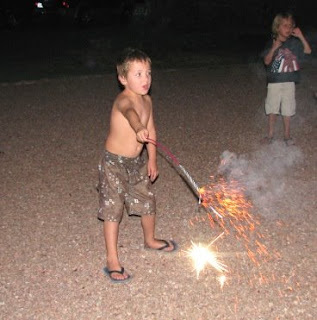 The kids had fun with these giant sparklers and even more fun watching the fireworks up close and personal. Thanks for letting us all come over Kimmy! What a show huh?! I’ll spare everyone our dance pictures! Brace yourself for these insane brownies. Friday was also my cutest grandpa’s 90th Birthday party and I wanted to bring him something special and special these were! 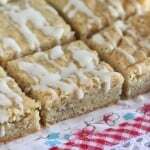 This recipe was inspired by a recipe in my 2004 Pillsbury Bake-off magazine. This was my very first cook-off experience and I remember seeing this particular recipe thinking, oh man this one is going to win the million. It didn’t end up winning, but I have to say it is a winner in my book! I adapted it and turned them into brownies, surprise surprise. You can find the original recipe HERE. She uses a chocolate chip cookie crust, I’m sure equally as yummy! Now, I was really impatient and cut into these too soon, if you wait and chill them in the fridge, they cut beautifully and you can see the nice layers. Otherwise, you’ll get the gooey version, which isn’t bad either. Make sure you spray the foil very well, the marshmallows get sticky. Super sweet and absolutely sinful! 2. During the last 2 minutes of baking brownies, sprinkle marshmallows over top, bake for 2 minutes or until marshmallows just begin to puff. Remove from oven. 3. In a medium saucepan melt butter, corn syrup and peanut butter chips over medium heat until just melted. Pour mixture over popcorn and stir until coated. Place over marshmallow layer. In a microwave safe bowl melt chocolate chips in 30 second intervals or until melted smooth. Pour into the corner of a ziplock baggie and snip one corner. Drizzle chocolate back and forth over brownies. Let cool completely before slicing into squares!! Don’t be impatient like me!! Insane is the word! I don’t even want to think how good these must be or I’ll have to make myself a batch! I’m sure I would be impatiente as well, I mean how can you not be? Congratulations to your grandpa, mine is 89! I was also inspired by the cook-off this past week. I had to try the most recent winner, the Double-Delight Peanut Butter cookies. They look great. I remember thinking the same thing about the PBO brownies-especially since they used about four sponsor products. Oh, boy those look dangerous! Oh my gosh, these look AMAZING!! I’m going to have to make them soon. Yah, I needed to wait another hour before I cut into these, but just couldn’t handle the temptation! Thanks for visiting my blog. I love that double delight peanut butter cookie, it’s great! We did have a good 4th. I was really surprised this recipe didn’t win her category. Outrageous these are to much! oh wow, these look scrumptious! 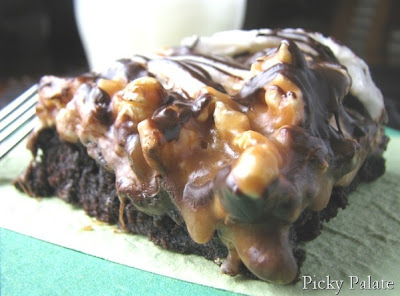 i have totally been craving brownies since i had a dream about some! You should be nothing but proud of our dance moves!!! Loved your brownies! Seriously, how do you stay so thin? 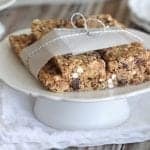 These look so intensely delicious it would be impossible to not gain five pounds just by making them, let alone eating them! I bet your grandpa loved these! I just love this blog, You Put a big smile in my kitchen! I love your brownie concoctions! They always look terrific. Happy birthday to Grandpa! Hope you all had a good 4th. Your husband really knows how to tear up the dance floor! Sure sounds like you had a wonderful time! Happy birthday to your favourite grandpa and all the best wishes 🙂 I’m sure he loved these tempting brownies. I’d actually take the gooey version over the chilled one anytime. Thanks Jenny..the cornbread is SUPER moist..its better the next day after the glaze soaks in! Enjoy! Those do look absolutely insane! Can’t wait to try those bad boys! 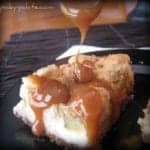 i am sooo making these tomorrow. seriously woman – your gonna ruin my arse!! O. M. G. All of my favorite food groups in one. I need to make these. Need. to. 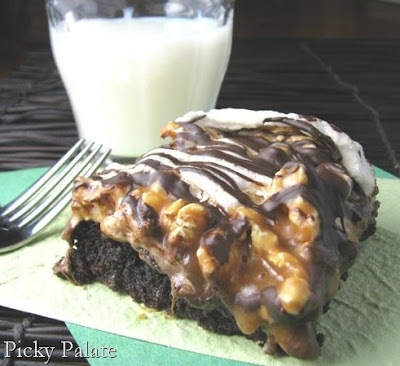 I’m looking for the BEST brownie recipe, and this one certainly is up there. Wow – i don’t think it gets any better than this! holy gooey-ness!! i so have to make these! I really enjoy looking at all your recipes! Yummy, I made this last night and I am making another batch tonight to give to a friend. It was super yummy and really easy to make. This is like all the best foods combined into one!